– ชอบออกกำลังกายมากค่ะ /chôrp òrk-gam-lang-gaaimâak kâ/ I like to exercise a lot. Ex. คุณไปทำงานยังไง /kun bpai tam-ngaan yang-ngai?/ How do you go to work? Ex. คุณสูงเท่าไหร่ /kun sŭung tâo-rài?/ How tall are you? คุณอายุเท่าไหร่ /kun aa-yú tâo-rài?/ How old are you? 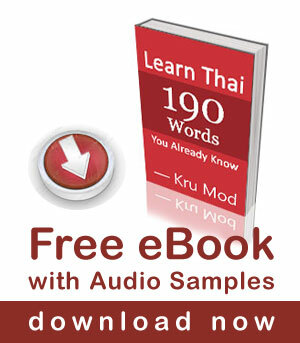 คุณเรียนภาษาไทยนานเท่าไหร่ /kun rian paa-săa tai naan tâo-rài?/ How long did you study Thai? Ex. เผ็ดแค่ไหน /pèd kâe-năi/ How spicy is it? How many kilometers did you run? EX. เพื่อนกี่คน /pûean gìi kon/ How many friends? How many Thai friends do you have? You said : ” My comment is awaiting moderation ” for several days …… Can you explain to me “what is the trouble ” or what i might have missed “to do” in some way ? Swatdee ka Christiane, I am sorry for this. It is actually the setting in WordPress, I have to approve all comments before it shows and it is my own mistake that I forgot about this setting and didn’t check for the pending comments for a long while. Please accept my apology. Looking forward seeing your new pleasant videos soon with others scenarios ! All of them are so useful ! Thanks SO MUCH, Dear Kru Mod, for this useful Video ! I am looking forward to see you again on new-ones, and say ” MANY CONGRATULATIONS for your excellent and helpful work ” ! This is the last video I remember being uploaded to your Youtube channel before it was closed and you opened a new one. I’m so glad that I’m up to date again! Yay! Thank you Kru Mod! i i need to translate 235 page from thai ti english .how much it will cost me? my phone namber is : 972+545274769.thank’s. Sawatdee ka Yoram, apologies for my late reply. I am sorry I don’t do translation work. I have learnt that the question word mái should be written : ไหม but i see you write it มั้ย, which is closer to the actual pronunciation (้high tone). Are both spellings correct ? Very pretty fun thaï Language Lesson . By the way at what time of the day do you prefer running in Bangkok and where?